“GDP does not measure the output of the economy any more”. Do you cagree, and if so, what improvements would you suggest? The RES Essay Competition contributes £2000 to GDP in the form of prize money. This statistic is unchanged whether it stimulates thousands of essays of extraordinary quality that provide new insights for the economics profession and transform the academic prospects of the authors, or only ten substandard essays that bore the judges senseless. 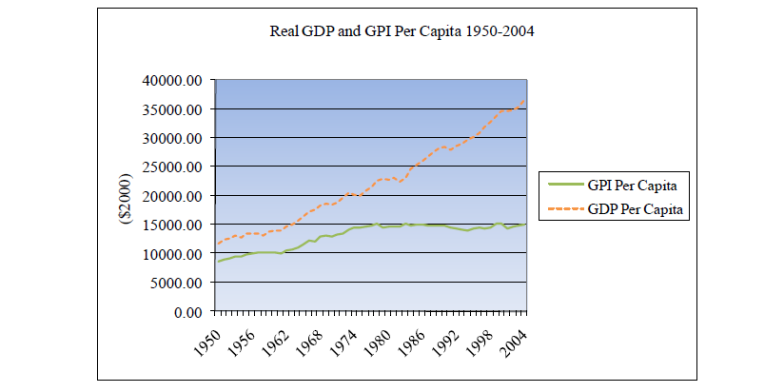 GDP therefore has never been a complete measure of economic output, still less of economic welfare. GDP does not measure many of the things that really matter to us, such as leisure, happiness, security, or the welfare of the poorest in society. It does not differentiate between activities that pollute the environment and those that safeguard it – indeed combatting climate change by energy saving actually reduces GDP1. It does not differentiate between activities that threaten well-being and those that contribute to it – nuclear weapons and cigarettes count as much as Harry Potter World. GDP measures the flow of goods and services produced within a country and sold for money in any given year. Born in an age of manufacturing and agriculture, it measures what we are buying and selling. However, some goods and particularly some services - which have become an ever more important element in the global economy - do not have market prices, and GDP either ignores them or estimates their value. Most government expenditure - for example health services, national security and parliament - has no market value, and the value of these services is estimated on the basis of their cost. Valuing at cost is at best a poor approximation of benefit to the consumer or society, yet in the UK this estimate of the value of government expenditure represents over 40% of GDP2. Similarly, an estimate or “imputed rental” is made of the housing services consumed by owner-occupiers, which in the UK represents approximately 10% of GDP3. Illegal activity used to be ignored in the national accounts, but imputed figures for the “services” of providing access to illegal drugs and prostitution now add over £10 billion to UK GDP4. Some hugely important areas of economic and social activity continue to be ignored in GDP calculations, including housework, child care, caring for elderly relatives, and volunteering. The OECD in 2011 calculated that if unpaid work carrying out services such as cooking, cleaning, gardening and caring in the UK was valued on the basis of the average hourly wage, it would be equivalent to over 75% of GDP5. Such “margins of error” can also be seen in the GDP figures of developing countries – the GDP of Ghana jumped 60% in 2010 and that of Nigeria by 89% in 2014, purely because their GDP calculations were re-based6. Moreover, GDP struggles with the concept of quality. Attempts are made to adjust GDP for the fact that the cars and computers we buy today are faster and more advanced than in the past7, but GDP tells us nothing about the quality of the bread or fish and chips we buy, nor about road or airline safety8. Given all its shortcomings, it is no surprise that many economists criticise governments’ over-reliance on GDP for policy making. However in the age of the internet, where business models are being transformed and new and often free services are becoming fundamental to consumers, the question needs to be asked whether GDP as a measure is past its sell by date. One of the features of the digital age is that services are often provided for free – or at least at no direct monetary cost to the consumer. These services are genuinely valued by consumers, but this important output is ignored by GDP, which assigns no value to goods with a price of zero. Indeed, the switch to new and better services which increase consumer utility can actually reduce GDP. To research this essay, instead of buying books or paying a bus fare to visit the library, I searched for online information through Google – at no cost. To keep in touch with my friends, instead of buying a stamp or paying for a phone call, I message them on Facebook or call them on FaceTime, again at no cost. Instead of heading to a record shop and buying a CD, I stream music recordings on spotify, for free. High street shops, bank branches and ticket offices are closing, and so cutting jobs and reducing investment in buildings (and reducing GDP), because I can access financial services, buy clothes and book journeys online, from the comfort of my bedroom. Another phenomenon of the digital economy is volunteering and sharing. Business models such as Airbnb and Uber make more use of sharing what already exists – owned housing and cars – rather than making new products. I get enjoyment from blogs and video clips uploaded by volunteers onto the internet. With the possible exceptions of when advertising or crowdsourcing get involved, GDP ignores such private and societal goods. Moreover, even when a fee is involved, the power of the internet enables a better matching of supply to consumer taste. I can order a unique birthday card, the picture and wording perfectly suited for my father, at exactly the same price as a mass-produced greetings card; and I can search for a lower price than I am prepared to pay for a hotel room, a train ticket or a laptop. Yet GDP does not capture this increased consumer surplus, as all it measures is the number of transactions and the price paid9. All the above of course applies equally to the factor income method of calculating GDP – income in the form of rent, interest, profit and wages. At first sight the huge boost to output and welfare generated by the digital revolution looks to be well reflected in incomes: the founders of Facebook, Microsoft and Amazon have amassed a combined wealth of nearly $300 billion10, while $990 invested in Apple in 1980 would have generated a return of $440,000 today11. However, this of course ignores the losers of IT’s “creative destruction” – the loss of employment income from the collapse of companies such as Polaroid, Kodak and Toys R Us and the loss of advertising income for newspapers. Across the economy, as prices do not fully reflect output, nor can incomes. The fact that GDP does not measure, or only guesstimates, so much of the output produced and benefits consumed by society perhaps explains the “productivity paradox”, when amidst ever-increasing computerisation (and automation) productivity figures do not rise as expected, or indeed appear to fall12. However, GPI is flawed because it relies on assumptions and value judgements that may not hold for all people at all times – for example that an increase in the area of wetland or farmland is always a positive15 - and because it relies even more than GDP on estimated values. Moreover, it does little to address the digital economy shortcomings of GDP. To better account for progress in a digital age may require less focus on output and more on the benefits accruing to consumers – benefits including access to services and information at zero cost which in other circumstances consumers would be prepared to pay for; access to goods and services which better meet individual consumers’ preferences; and innovations that enable the consumer to reduce expenditures on goods and services. The problem is not just that GDP no longer fully measures economic output, but also that we need to re-think what we mean by “output”. 7 “Quality Adjustment”, Chapter 6, Office for National Statistics, available at https://www.ons.gov.uk/...quality/.../quality-adjustment/chapter-6---quality-adjustment.